Janeka Jenkins, a financial analyst for the Department of Anesthesiology, stuffed paperwork into her tote bag to review later at home then made a mental note to ask her mentor about focus and time management at work. Practical advice is part of Jenkins’ mentoring relationship with Kennedine Mack, associate director of financial and payroll services for Student Affairs. “She can give me practical tips, but she’s also my cheerleader,” Jenkins said of Mack. Jenkins asked Mack to be her mentor a year ago to help her understand career opportunities in the financial world at Duke. Mentoring is a classic tool for career growth and professional development, offering employees a chance to informally enhance their careers and interpersonal development. 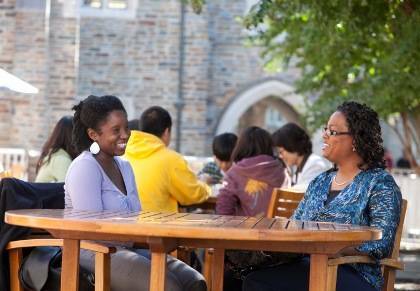 Duke’s Human Resources webpages have resources and tips about how to find, work with and part from a mentor. Starting a mentor/mentee relationship with structure and clear guidelines is vital to a successful experience, said Kelly Cottrell, a professional development specialist at Duke’s Professional Development Institute. Employees who want a mentor should take time to write down what they want to learn before they approach someone. Employees may also want to conduct an informational interview before asking someone to serve in a mentoring role. “Mentoring is about creating a relationship, and it is very important for the person requesting that relationship to take the reins from the beginning,” she said. Jenkins, the financial analyst for the Department of Anesthesiology, started her search for a mentor in 2010, after reading information on the Human Resources website. She had moved from the banking industry to academia, and was eager to connect with someone who understood Duke’s culture. Cottrell, who had previously worked with Jenkins to reorganize her resume, suggested that Jenkins contact Mack, who has worked in finances in four departments over 16 years at Duke. Jenkins sent an email and followed up with a phone call to arrange a first meeting. Then she began writing a list of questions around what classes to take, what network events to attend, and how to move into a new job at Duke. Mack and Jenkins agreed to have lunch together once a month for a year. Over pizza and salad, they discuss topics like work/life balance and Jenkins’ interest in Visual Basic programming for Excel. Over the year, Jenkins has followed Mack’s advice on matters, including shutting her office door to eliminate distractions to taking an advanced Visual Basic programming workshop at North Carolina State University. Next week, Jenkins and Mack will celebrate the completion of their mentoring with lunch on West Campus. Although their formal mentor/mentee relationship will end, they will check in once or twice a year.